The Risk Management and Insurance Program at the CU Denver Business School was founded with the strong support and involvement of industry partners. For the second summer in a row, the RMI program has been able to give back to the community by offering a free summer class to local high school students. 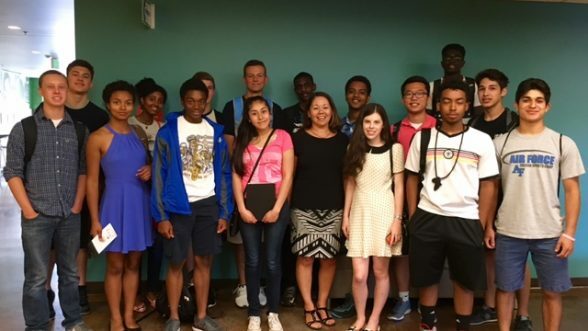 This summer, 18 students from Colorado high schools participated in the Introduction to Risk Management Careers course and earned a free CU academic credit. Lecturer Cindy Baroway developed the class to introduce rising high school juniors, seniors, and college freshmen to the rewarding and often overlooked field of risk management and insurance. Students from Mountain Range, Legend, Horizon, Denver School of Science & Technology, Cherry Creek, South, and Douglas County high schools heard from industry professionals who spoke about their careers and the bright future for students entering the industry. “In the next decade, over 60% of risk management professionals will retire, leaving a talent gap, but also great opportunities for students to launch and grow successful careers that benefit society,” explained Baroway. She should know, as the former National President of CPCU Society (Chartered Property and Casualty Underwriter) and a claims professional in Denver over the past 20 years. Students learned about many aspects of the industry, and made excellent networking connections. They asked many insightful questions of industry leaders, and discovered they have skills that are valued in the risk and insurance professions. They also learned the risk industry was much more varied and interesting than they ever realized. Industry professionals included IMA Financial Group, TriMountain Corp., The Head Insurance Group, the City of Lakewood, CoorsTek, Northwestern Mutual, Travelers Insurance, Sedgewick Claims Management Services, and RMIIA (Rocky Mountain Insurance Information Association). This representative group from public, private, local and national companies gave students an idea of the breadth of the industry and the many jobs and skillsets in demand. Many of these industry partners have supported the RMI program by offering scholarships, internships, career, and shadow day opportunities. The class enjoyed a day of field trips to two corporate offices, Northwestern Mutual and IMA Financial. There, they learned about potential internships, experienced different corporate cultures, and saw insurance work in action. As part of their coursework, students interviewed a risk professional and wrote about what they learned. Two students interviewed their parents who work in the risk industry. “For the first time, I understand what my father does. It is more interesting than I realized!” one student commented.